Started this thread for women wrestlers that just don't fall into the WWE or TNA categories. Angel Orsini.. been around along while on the indy scene. Nice lady and down to earth with nice arms. April Hunter.. though she's appeared on TNA she isn't full time there yet. April was really cool. I asked if I could feel her bicep and she obliged... and good Lord did it feel nice and solid ! Then without me asking she flexed her tricep and told me to feel it ! I was definitely smitten with April after that. She climbed quickly into my top 10 favs ! 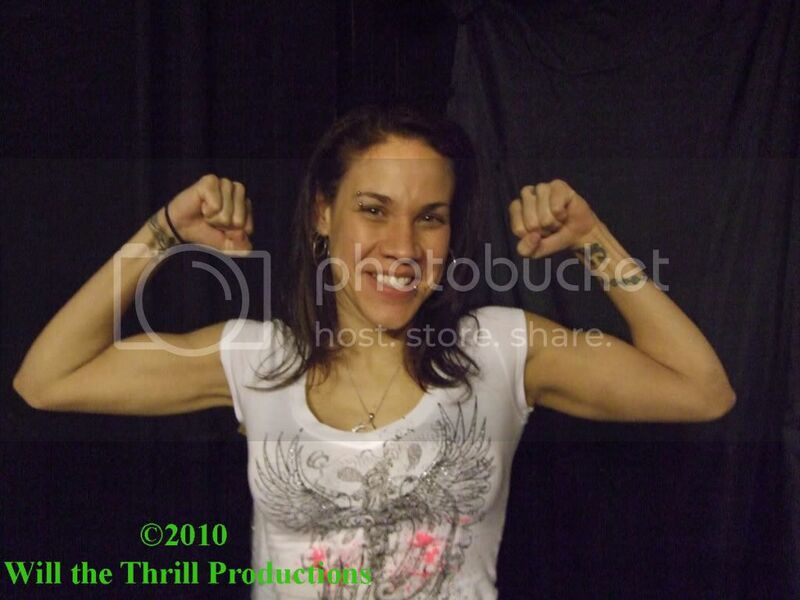 Mercedes Martinez.. very nice and personable. One of the best workers out there on the indy scene. Not a known flexer she was very accommodating when I asked. Very cool lady though I think she'd look better without the hardware in her lips. Read that Mercedes did a 35 minute match with Rain at this show. That's a long time for the women; how was it? Also April will be teaming with Traci Brooks. Now that's an eye-popping pair! I only did the greet and meet, didn't do the show. Had to be back up north. I'll say this, I wish they would find less dumpy venues to have these events at. Looked like the building was an old small warehouse that is an auto body shop on the first floor and up stairs was one big open room. That is where they had the "convention" and the wrestling event later that night. Looked like the building was an old small warehouse that is an auto body shop on the first floor and up stairs was one big open room. That is where they had the "convention" and the wrestling event later that night. They have auto auctions in classier places than this! 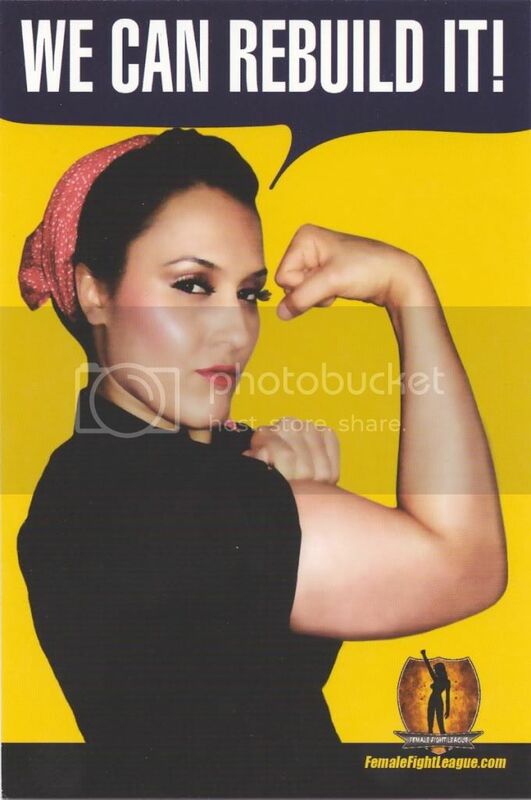 Alissa Flash/Cheerleader Melissa/Melissa Anderson doing her version of Rosie the riveter for a promotion for the femalefightleague.com. The hopeful launch of that promotion maybe be our only hope anymore of seeing truly athletic female "wrestlers". Thanks! On that same wrestlin wally website, there are literally another 100+ flexes of various Indy ladies. I've picked up a few Trixie Lynn, but the only other one I've heard of was Ms. Death Ray herself. Most aren't worth posting, but they're there is anyone is interested. The hopeful launch of that promotion maybe be our only hope anymore of seeing truly athletic female "wrestlers". Ooooh, Wrestlicious baby . . .
Today you will see Becky Bayless vs. Danyah and Mercedes Martinez vs. Lorelei Lee. Course none of them are using those names, but the wrestling is about the same, and its the best we saw on TX this week. Just have to ignore the silly storylines. Good thing Vince doesn't own the NPC! April would be too old to compete. Now the question is, which is more predetermined, pro wrestling or figure comps? Well until Mickie finds a home might as well post pics of her here. From her Twitter account Mickie and her gun... no, gun, for real. Think she is imagining the perverted old fart is at the other end of that rifle ? When you click on the link it will ask you if you want to open or save the file. The photo does not open directly. Think John Cena might be hiding in those woods someplace? I always knew there was something besides her muscles I liked. A morning wakeup deserves female muscle.